As the centennial of World War I, the “war to end all wars” closes, many previously underreported events and topics are finally receiving the coverage by historians they deserve. One of these topics is the final year of the war, particularly the restoration of certain maneuvers to the battlefield after years of stalemated trench warfare. The German, and later the Allied offensives of 1918 produced some of the heaviest fighting of the war, introducing new tactics and weapons that foreshadowed the fully mechanized and motorized successor conflict twenty years later. However, for the average solider, these changes to warfare were beyond their sight or comprehension. His attention was focused on staying alive for another day and not letting down his comrades in his platoon or company. 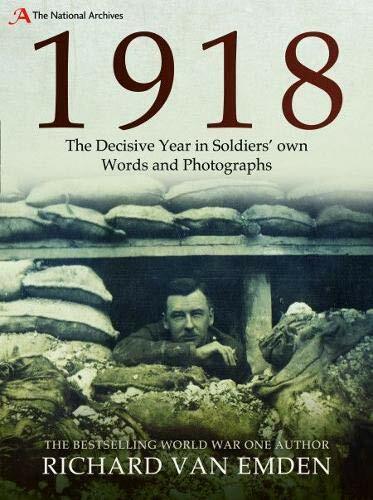 This book chronicles the lives of these ordinary soldiers in the British Army and their German opponents on the Western Front during the final year of the Great War. Told through a marvelous melding of diary entries and dozens of previously unpublished photos taken by the soldiers on forbidden cameras they smuggled in their gear, the author lets the participants’ words stand alone, with only a minimal intrusion of paragraphs to provide context and continuity, and maps to provide some spatial placement of the action. The author takes the reader through the mundane, absurd, terrifying, and cynical viewpoints of these soldiers as they try and not only stay alive but come to terms with the death and destruction that stalks them every day. The selection of a fairly small group of subjects from both sides offers interesting contrasts as German and British troops react to the ebb and flow of the fortunes of war. These selected group of soldiers are followed throughout the year until they either reach the Armistice or are wounded in action. The photos, many washed out or damaged from time, provide an eerie eyewitness to the destruction and squalor of the 1918 battlefields, many of them territory already trod from the 1916 Somme or the 1917 Passchendaele campaigns. Other pictures provide a poignant look at soldiers doing ordinary activities like eating a meal or trying to find a moment’s peace among the carnage around them. The selection of photos puts a definite human face on both the British troops and their German enemies as the final struggle unfolds. When 1918 begins with a very cold winter, there is a huge sense of anticipation of a climax to the war. Russia’s departure and America’s entry into the war provide hope to both the British and Germans, as British troops along the front wait for the expected spring offensive by thousands of German soldiers transferred from Russia to France for one final effort to win the war before Germany’s strength is exhausted. When it finally begins, the German offensive tears huge holes in the British front, and the chaos and fear of retreating under fire overtakes many of the diarists. Unprepared for the mass and violence of new German tactics, the British Army nearly breaks. But the Germans never quite achieve a full breakthrough and as spring settles into summer, the truth that Germany cannot win the war before American troops surge into France sets in for both sides. During this time period, the first whisperings of what will be known as the Spanish Influenza, which swept the globe and killed nearly as many people as the war itself, were recorded in many of the diaries. Several entries noted an entire platoon or company coming down with the disease, which killed a large proportion of young and healthy people. Once the German offensives are spent, draining their last reserves of offensive capability, the Allies begin their final series of offensives that will end the war. Interestingly, many of the British troops are nearly as wary and confused on the offensive. Four years of almost static war has curtailed their offensive spirit, and heavy casualties have made both sides cautious and guarded as the British push the Germans out of huge swathes of Belgium and France, crossing over many still churned up battlefields from the opening offensive of 1914. When rumors of a potential Armistice emerge, soldiers on both sides become understandably reluctant to become the last casualty of the war, and their cynicism and caution to avoid serious combat during the first days of November comes through. The book ends with tales of occupation, demobilization, and a surprising sense of disillusionment by many soldiers who find their country quickly forgetting the sacrifice they made and the horrors they endured. One soldier laments the loss of youth as he entered the war a young man of 17 and survived four years to emerge a changed survivor at 21. While all the troops were anxious to get home, many had trouble melding back into society, a phenomenon that hasn’t changed 100 years later. The final entry in a series of books covering the lives of ordinary British soldiers in World War I, this volume is a fitting tribute to these now departed warriors. Like all wars, World War I was fought by young men who were often tired, hungry, and scared but showed tremendous acts of bravery and sacrifice. They deserve to be remembered.